A movie that probes into the psychology of death, but then also, it’s so full of life! Nowadays most of the Hindi films released can deftly be categorised to the limit of some particular genre, and easily conjecturable to a certain theme or message or even the complete lack of it! But then once in a while a few unique films emerge (fortunately) which dare to defy such generalisations, and restrict themselves from spoon-feeding the audience with ponderous morals in-between ceaseless cheesy histrionics. 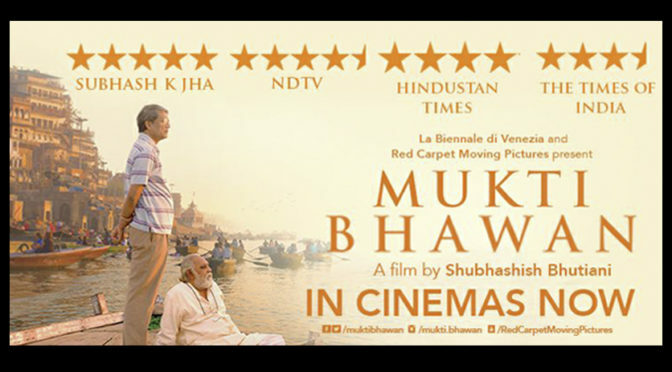 Yes, Mukti Bhawan is one such film that cannot be bound into one specific keynote, it has to be experienced on the whole, much like an opera, or like life and death! 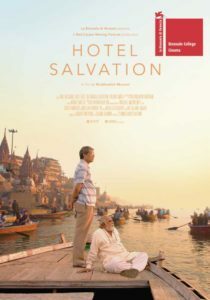 When 77-year-old retired school-teacher Dayashanker Sharma (Lalit Behl) senses his life’s extremity (the hint being a curious recurring dream), it becomes obligatory for his son Rajiv (Adil Hussain) to comply (though grudgingly) with his old man’s somewhat odd request – an immediate visit to the holy city of Varanasi. Varanasi, the essential and well utilised backdrop of the film, ordained by the sacred Ganges the ancient Indian city that epitomises spiritualism and divinity. And aged Dayashanker believes that death in this holy city can be his ticket to eternal salvation – an escape from the inevitable cycle of life and death! And thus, to the surprise of the rest of the family that includes Daya’s daughter-in-law Lata (Geetanjali Kulkarni) and Daya’s grand-daughter Sunita (Palomi Ghosh), Daya and Rajiv, the father-son duo leaves for Varanasi. 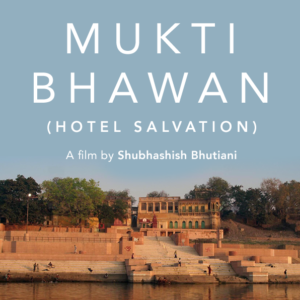 They finally check in at an aptly named hotel called Mukti Bhawan or Hotel Salvation; where numerous people from all across India come and wait for their death, a tradition to achieve Moksha! Director Shubhashish Bhutiani, who has also written the script along with Asad Hussain, has ingeniously explored the intricacy of human emotions on the face of death in his film. The script, the situations, the dialogues, the relations are simply subtle yet so profound! UNESCO jury has already awarded the XXIIIrd prix “Enrico Fulchignoni” to the young debutant director and at the Venice Film Festival, the world premier of Mukti Bhawan, the film was cherished by the audience with a stupendous standing ovation after the screening! Then again, the film is specially blessed with actors who are of such supreme control of their skills. Adil Hussain, just within a decade have become one of the finest actors of our country, made his presence felt in acclaimed movies like English Vinglish, Life of Pi, Parched, Sunrise; but in this particular film his performance excels like never before. No wonder he won a Special Mention from the National Award Jury this year! And of course, the veteran TV and theatre actor Lalit Behl, this being his second film (after Titli) has played his pivotal part with such immense commitment, so brilliantly natural and believable! And then, renowned actress Geetanjali Kulkarni, young and effortless Palomi Ghosh, Navnindra Behl as the sweet and smiling widow and Anil K. Rastogi as the weird manager of the hotel – all have given their best and are very much responsible for the success of the film! 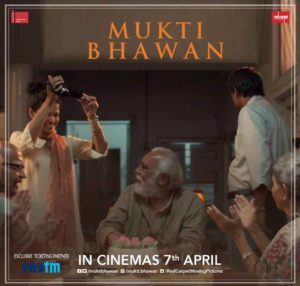 Mukti Bhawan may be a statement on life and death or it may simply be a very precise discectomy of human relations; I hope you will decide yourself once you watch it. Mark my words, this is a Cinema that shouldn’t be missed!